The Kaiser black and white darkroom safelight has a dull plastic housing and is tiltable from 0-40 degrees. It may be used simply placed on a table top or some other flat surface, or wall / ceiling mounted where it can be set up for either indirect or direct lighting of the working area. Has a 9x12cm interchangeable filter for graded or multigrade black and white papers (some more old fashioned papers require a red filter - always perform a safelight test) supplied with 15w lamp. Whilst it is more costly than the Paterson safelight, the Kaiser safelight throws the light more directionally, and this can be useful. 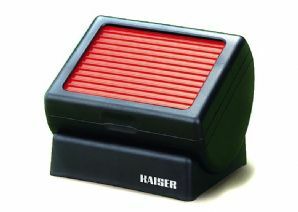 Kaiser are the leading manufacturer of darkroom products from Germany.